Capt. Sudip Bose arrives on the airport tarmac. Post-Traumatic Stress Disorder, or PTSD, is a complex issue. The way that being at war, fighting on the front lines or engaging in combat affects a person is different for everyone. Some combat veterans come home shattered and shaken and have a hard time moving on. 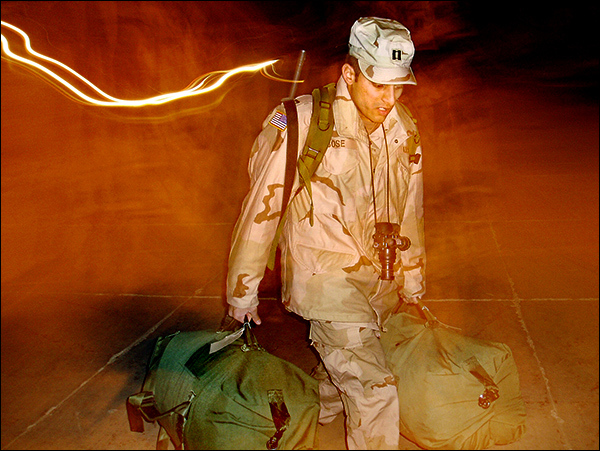 Some come home seemingly ready to dive back into normal life and put the war behind them. Make no mistake; war affects everyone subjected to it. It just depends how each person processes that experience and what kind of support they have when they get back home. In a TED Talk, journalist Sebastian Junger, who has covered war for almost 20 years and produced a great deal of material on the subject – most of it related to Afghanistan – made what I thought was a very interesting observation, which subsequently provoked an interesting question. He said that he thought it was remarkable how many soldiers actually found themselves missing combat. Missing combat? According to Junger — who has a bachelor’s degree from Wesleyan University in cultural anthropology – it’s a simple, one-word answer: Brotherhood. It’s different from friendship, he explains. “Brotherhood has nothing to do with how you feel about the other person. It’s a mutual agreement in a group that you will put the welfare of the group, you will put the safety of everyone in the group above your own.” Junger equates it to being in a close-knit, tribal society – in fact he wrote an entire book on the subject, called “Tribe”. I would say that I think he’s got that part right. From my own experience of being an Army medical officer on the front lines of Iraq, there’s nothing that compares to how combat and the almost constant threat of death draws you and the men serving with you closer than almost any bond that can be developed outside of that experience. You leave the closeness of that temporary society that’s developed around your particular war experience and you return stateside with a changed perspective and walk back into a modern society so fractured that each side of the political divide is charging the other with shouts of “treason!” Brotherhood? Hardly. That perspective makes sense when you understand some of the statistics around PTSD. Perhaps the problem is not an isolated traumatic event our armed forces fighters experienced. Perhaps the problem is us. Our lack of brotherhood. We — the American people — owe these men and women everything. Don’t think of it in terms of a simple “thank you” — this is beyond that. This is our duty. This is ongoing, continuous support for these military members who signed up to go in harms way (so others do not have to, unlike nations where military service is mandatory). They volunteered to enter a military service, to be deployed all over the world in some of the hottest combat zones anywhere, and who in some cases faced the most fearsome hell on earth that a human being could ever face. They stood up to enemy fire, and they took the bullets for the rest of us. This is a watch we in society need to stand. Imagine three or four tours of duty in Iraq or Afghanistan, or both. You’re there, not knowing if today’s the day you’ll get into it with the enemy – if today’s the day an IED will light up your Humvee and leave your buddies or you maimed and mangled, without limbs in some cases. Burned over a majority of your body. Or dead. Sometimes it doesn’t even have to happen to you or anyone close to you – it can just happen. That’s how it goes in war. One minute there’s peace, then before you know it, bullets are flying, explosions are detonating and you’re in the middle of it. Whether a veteran’s service was for two years, four years or 30 – it doesn’t matter. This is our debt. This is our gratitude. We as a nation need to come together as a whole and support all veterans, particularly those who are suffering from physical wounds, PTSD, or both. Of course, the worst outcome for a veteran struggling with PTSD is when it culminates in a suicide. That’s a tragic loss. You might be familiar with the statistic that was reported in a study from 2013 by the US Department of Veterans Affairs that showed that from between 1998 to 2010, an average of 22 veterans were committing suicide each day – or one every 65 minutes. According to the most recent report published by the VA in 2016, which analyzed 55 million veterans’ records from 1979 to 2014, the current analysis has revised that number down slightly; the findings indicate that an average of 20 veterans a day die from suicide. US military veteran suicide is relatively high compared to the general public. According to a study done by the U.S. Department of Veterans Affairs, deployed veterans had a 41 percent higher suicide risk compared to the general US population, and non-deployed veterans had a 61 percent higher suicide risk compared to the general population. To me, this implies that “brotherhood” from combat is protective. There is a lower suicide rate when deployed than when non-deployed. Got a job opening? Offer it to a qualified vet. Their experiences of operating both individually and on a team can be invaluable for a company. If you’re looking for leaders, consider these 20-something or 30-something veterans who at even younger ages sometimes led other soldiers on life-or-death missions. If you’re looking for buttoned-up employees, you don’t get more buttoned up when you’re in the military adhering to strict rules of dress and discipline – especially if you’ve been in combat. Find ways to let them know that you’ve got their back. Treating PTSD requires the same kind of commitment to help a veteran re-learn skills for living in a normal, civilian world. These men and women spend countless hours training for combat, and they often will need to spend countless hours in re-training to adapt to the environment back home, away from combat. So if we can help them with a similar kind of dedication – just like the kind they made in training for combat – to training to live with comfort back in suburbia in peacetime, those vets will in time become recalibrated, if you will, to a more normal life. But part of the burden should be on us, as a society, to meet that veteran where he or she is – to assume the role of helping veterans re-integrate, so that the onus is on us, not on the veteran to “adapt back.” It’s as much our fault if veterans feel alienated or isolated when they come back; it’s not on them. Instead of PTSD, Junger called it “Post-Traumatic Alienation Syndrome.” I think of it along the lines of “Post-Traumatic Isolation Syndrome.” Either label is probably more apropos than PTSD. I frequently speak at corporations and take the skills I learned in combat and in the emergency room to teach leadership lessons and how to apply them to everyday life – it’s probably my favorite topic to speak on. Through my lectures and media appearances throughout the country, I’m able to raise awareness and funds for TheBattleContinues.org. The Battle Continues Inc. is a 501(c)(3) nonprofit organization aimed to raise awareness and help veterans who have returned from war; 100 percent of money donated to the organization goes towards assisting and supporting veterans. I also promote healthy living and awareness on health care issues so that people can make better-informed decisions regarding their health. I’m a firm believer that our health is our single most important asset. So remember, as my motto proclaims, to “keep your inner Army strong” and let’s take responsibility to serve those who served us. To learn more about Dr. Sudip Bose, MD, please go to SudipBose.com and visit his nonprofit TheBattleContinues.org where 100 percent of donations go directly to injured veterans.